"There will be no constraints regarding the consumption of candy on Halloween night." For us, whatever parenting rule may exist about allowing kids to eat candy, Halloween is an exception. 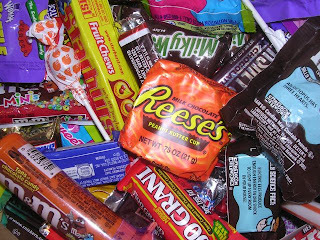 On Halloween night, after each child has gathered as much candy as they can carry - they are completely at liberty to eat as much as they want. Come what may. Yes, Im a horrible parent. Get over it. I agree. Bring on the candy.